The ability to predict tides and currents is essential for people who rely on the sea for their livelihood. 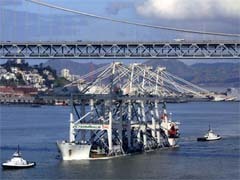 Knowledge of the marine conditions was critical in transporting these four marine cranes, each 220 feet tall and worth approximately $1.25 million, beneath the Oakland Bridge in San Francisco Bay. Click the image for a larger view and detailed description. Predicting tides has always been important to people who look to the sea for their livelihood. Commercial and recreational fishermen use their knowledge of the tides and tidal currents to help them improve their catches. Depending on the species and water depth in a particular area, fish may concentrate during ebb or flood tidal currents. In some areas, strong tidal currents concentrate bait and smaller fish, attracting larger fish. In addition, knowledge of the tides has also been of interest to recreational beachgoers and surfers. Navigating ships through shallow water ports, intracoastal waterways and estuaries requires knowledge of the time and height of the tides as well as the speed and direction of the tidal currents. This was particularly critical to sailing ships because they had to take advantage of the tides and currents to manuever correctly. Knowledge of tides and currents is still critical because today’s vessels are much larger than the old sailing ships. The depths and widths of the channels in which they sail, and the increased marine traffic leaves very little room for error. Real-time water level, water current, and weather measurement systems now are being used in many major ports to provide mariners and port operators with the latest conditions. Marine commerce is one area in which tide and current predictions are critical. In June 2002, these four marine cranes valued at $5 million cleared the Oakland Bridge in San Francisco Bay by approximately 6 feet. Click the image for a larger view. 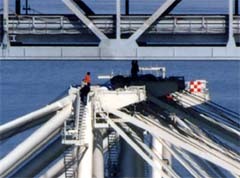 Coastal zone engineering projects, including the construction of bridges, docks, etc., require engineers to monitor fluctuating tide levels. Projects involving the construction, demolition or movement of large structures must be scheduled far in advance if an area experiences wide fluctuations in water levels during its tidal cycle. Habitat restoration projects also require accurate knowledge of tide and current conditions. Scientists are concerned with tides, water levels and tidal currents as well. Ecologists may focus on the tidal mixing of near-shore waters, where pollutants are removed and nutrients are recirculated. Tidal currents also move floating animals and plants to and from breeding areas in estuaries to deeper waters. Oceanographers or atmospheric scientists may study tidal fluctuations to better understand the circulation of the ocean and its relationship to world climatic changes.